Author and illustrator Ben Hatke is here today at Adventures of Cecelia Bedelia for an interview. His middle grade graphic novel Zita the Spacegirl is the first in a sci-fi comics trilogy that features a young heroine saving the day... and the planet. The third book, The Return of Zita the Spacegirl, was released by First Second (Macmillan) on May 13, 2014. 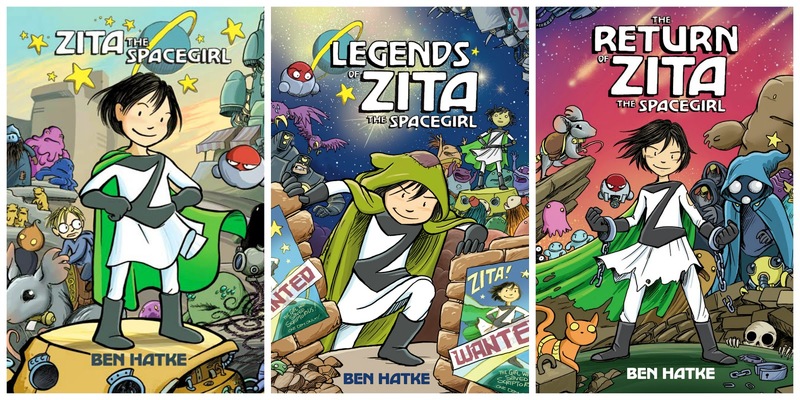 Ben Hatke's first graphic novel was Zita the Spacegirl. He has published comics stories in the Flight series as well as Flight Explorer. In addition to writing and drawing comics, he also paints in the naturalist tradition and, occasionally, performs one-man fire shows. Hatke lives and works in the Shenandoah Valley with his wife and their boisterous pack of daughters. You can learn more on his author website. You have four girls of your own. Did any of their antics inspire Zita's adventures? 1) that I have an immediate audience of different ages all checking up on my work. They are often my first story critics and it's great to talk to them about whatever I'm working on because they always let me know if story points are confusing, or if jokes fall flat. and 2) I have a bunch of little models of various ages running around. Sketching kids is a fantastic exercise, and because they really don't sit still you learn to draw fast -- catch things in as few lines as possible. In fact the book I'm working on now stars a 6-year-old girl, and I've caught a lot of poses from my own 6-year-old. What is your favorite Zita quality? I think it's her temper. She has this terrible sense of justice and she ends up being kind of a dangerous enemy when she's angry. 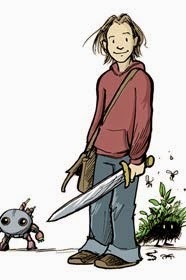 Who/what are your influences in comics and prose? Artistically, there's the intersection of Jim Henson and Brian Froud, Maurice Sendak and Trina Schart Hyman, Arthur Rackham and Howard Pyle.... And funny enough, I'm still very much inspired by the Italian Renaissance because it was a time of such explosive creativity when the idea of the artist and the inventor were often very much the same. Right now I am working on a book called Little Robot. It's about a young girl and a small robot and their very particular friendship over the course of a summer. It takes place in locations based on places near my own house so I've been able to go out and sketch from life quite a bit and take a lot of reference photos. It's been a really fun project. What's one book you read as an adult that you wish had been around when you were a kid? You know, I feel like there were more books that actually were around when I was a kid but that I just didn't know about. Jeff Smith's Bone was around when I was a teenager. WHY DIDN'T ANYBODY TELL ME? What is one sci-fi classic I absolutely MUST read? Oh man... I wish I had some little-known gem... If you haven't actually read The Time Machine then do that even if just for the crabs. And this might not qualify as a classic, but one book I've really enjoyed is The Draco Tavern by Larry Niven. It's like a whole book of the Star Wars cantina scene. Thank you for taking the time to answer those questions, Ben! 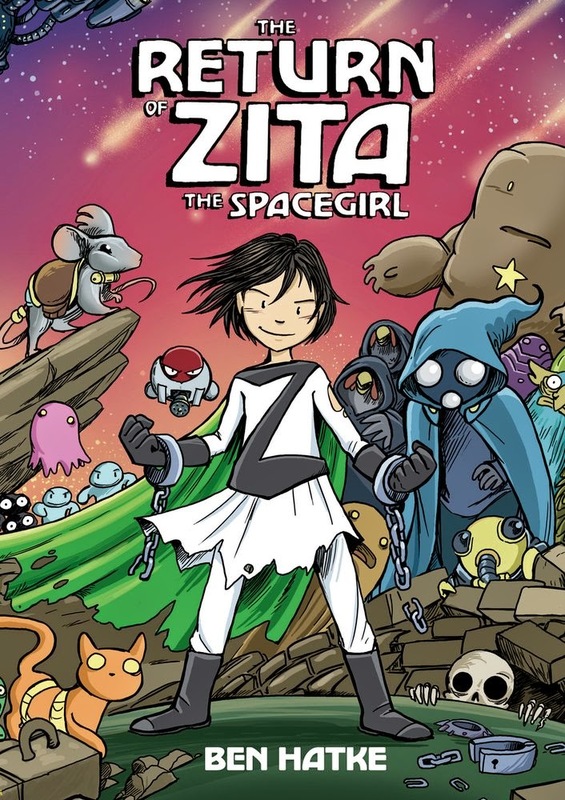 I thoroughly enjoyed Zita’s adventures (see my review of the first in the series here), especially the mix of humor and friendship, and the subtle homages to sci-fi in pop culture. I can’t wait to see where your next book takes us! Fine print: I received the Zita the Spacegirl trilogy for honest review from the publisher. I did not receive any compensation for this post.